Background and Objectives: Physical inactivity is an important cardiovascular risk factor. This study assessed the prevalence and factors associated with insufficient physical activity (PA) in urban and rural Vellore, Tamil Nadu, India, among adults aged 30–64 years. Methodology: A cross-sectional World Health Organization STEPS survey was carried out in 48 wards of Vellore Municipality and nine rural villages of Tamil Nadu in 2010–2012. 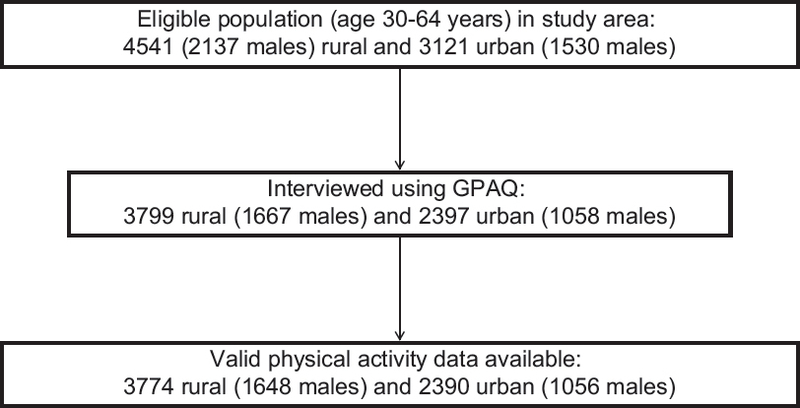 Adults (n = 6164, men 43.9%) aged 30–64 years were interviewed using the Global PA Questionnaire (2390 urban and 3774 rural). Insufficient PA was defined as not meeting the recommendation of 150 min of moderate aerobic PA, or 75 min of vigorous aerobic PA, or an equivalent combination, achieving at least 600 metabolic equivalent-minutes per day. Results: The prevalence of insufficient PA was 63.3% (95% confidence interval [CI]: 61.3%–65.3%) in the urban area and 40.6% (95% CI: 39.0%–42.2%) in the rural area. Women had a higher prevalence of insufficient PA compared to men, in both urban (70.8% vs. 53.8%) and rural (44.5% vs. 35.6%) areas. Those with higher education (odds ratio [OR]: 1.36, 95% CI: 1.20–1.53) and who were unemployed (OR: 2.97, 95% CI: 2.59–3.39) reported insufficient PA which was significantly higher than their counterparts. While urban participants had higher leisure time PA, rural participants had higher work- and travel-related PA. Conclusions: The high prevalence of insufficient PA found in this study shows that targeted interventions are needed to reduce insufficient PA, especially for women and urban populations. Physical inactivity has been termed a “global pandemic,” and the need to monitor its prevalence and develop interventions has been recognized. It has been estimated that physical inactivity may cause 6%–10% of the major noncommunicable diseases (NCDs) globally, including coronary heart disease (CHD), type 2 diabetes, and breast and colon cancers. Physical inactivity is associated with an economic burden of 1%–4% of the total direct health costs in high-income countries. A recent systematic review reported that 60–75 min of moderate physical activity (PA) per day eliminated the increased risk of death associated with high-sitting time. Prevalence of inactivity in India was estimated to be 13.4% (12.2%–14.8%) by the World Health Organization (WHO), among adults aged 18 years and above, while countrywide estimates based on the Integrated Disease Surveillance Project (IDSP) and Indian Council of Medical Research India Diabetes (ICMR-INDIAB) studies ranged between 42.3% and 81.2%., These differences may be related to different age groups sampled, methodology, as well as differences in study sites across the country. A review done by Bauman et al. on correlates of PA highlights the paucity of studies in low- and middle-income countries, with two-thirds of the studies in this group done in China and Brazil. The rising epidemic of NCDs in India warrants a closer look at magnitude and determinants of physical inactivity, which can in turn help in designing better interventions. Although Tamil Nadu has seen rapid improvements in health care, NCDs are rising rapidly, resulting in a “high epidemiological transition” situation. A study from Vellore has shown a threefold increase in diabetes and high body mass index, from 1991–1994 to 2011–2012. In this study, we have assessed the pattern of insufficient PA, as well as social and demographic factors associated with insufficient activity, among adults aged 30–64 years in urban and rural areas of Vellore district of Tamil Nadu, India. The study was carried out in nine randomly selected villages in a rural block and 48 wards out of 60 wards (12 wards selected consecutively from each of four zones) from the Vellore Corporation. In the urban area, one street was randomly selected in each ward and all adults (30–64 years) from the first 40 households were invited to participate in the study. In the rural area, all adults (30–64 years) in the nine selected villages were invited to participate. A household listing survey was done before the study, to identify the adults in the specified age group. Demographic and behavioral information was collected by trained field workers at the homes of participants. Sample size was calculated as 3000 for the urban area and 5000 for the rural area, based on the expected prevalence of CHD (urban: 6%, rural: 1.7%). The WHO STEPS questionnaire which includes PA measurement using the Global PA Questionnaire (GPAQ) was used. PA was defined based on the WHO recommendation for levels of PA for adults aged 18–64 years. This includes work-related, travel-related, and leisure time activities. Insufficient PA was defined as not meeting the WHO recommendation of at least 150 min of moderate-intensity aerobic PA, or 75 min of vigorous-intensity aerobic PA, or an equivalent combination of moderate- and vigorous-intensity activity, achieving at least 600 metabolic equivalents-minutes per day. As per the WHO's guidelines for analysis of GPAQ, those who had no reported involvement in work-related, travel-related, and leisure activity were classified as not having these kinds of PAs. Alcohol use was defined as those who had consumed any alcohol in the last 12 months, while tobacco use was classified as current smoking or daily use of smokeless tobacco. Data were analyzed using SPSS 24.0 for Windows (SPSS Inc., Chicago, IL, USA). Chi-square tests were used to compare proportions, and multivariable logistic regression was used to analyze the association between sociodemographic factors and physical inactivity. Ethical clearance was obtained from the concerned Institutional review board and ethics committee, and informed written consent was obtained from all the participants. The study included 6196 participants (2397 urban and 3799 rural), representing 83% and 77% of the rural and urban population aged 30–64 years in the study area [Figure 1]. Of 6196 participants, data on PA were available for 6164 (99.5%) individuals who were part of this study (2390 urban and 3774 rural) [Table 1]. A small proportion of the data on PA (0.5%) had to be discarded due to inconsistencies, following the recommendations of the GPAQ analysis guide. Male participants in the study were 2704 with a mean age of 46.3 years, and women were 3460 with a mean age of 45.2 years. The literacy rate was 63.3% in the rural area and 76.1% in the urban area. In the rural area, 23% of the population was involved in agriculture and 24% in manual labor, as compared to 0.9% and 8.4%, respectively, in the urban area. The prevalence of insufficient activity among urban residents was 63.3% (95% confidence interval [CI]: 61.3%–65.3%), while it was 40.6% (95% CI: 39.0%–42.2%) in the rural sample, P < 0.001 [Table 1]. While a higher percentage of the urban population reported leisure time PA, work- and travel-related PA involvement was higher in the rural area [Table 1]. Overall, women were significantly more inactive as compared to men in both urban (70.8% vs. 53.8%) and rural (44.5% vs. 35.6%) settings [Table 1]. Urban women were the least physically active group with only 29.2% classified as having sufficient activity. 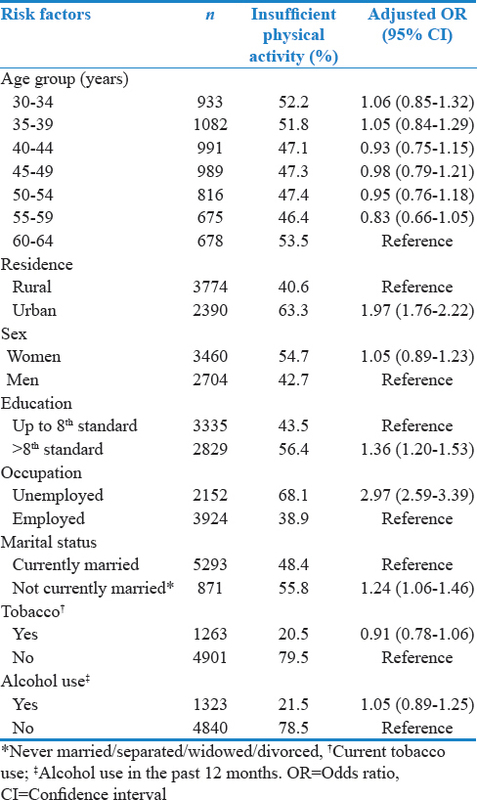 Women were more likely to have no leisure time activity than men, in both urban and rural areas [Table 1]. Similarly, travel-related activity was also lower among women. There was no difference between men and women for involvement in work-related activity, in both urban and rural areas. [Table 2] shows the level of insufficient PA by sociodemographic and behavioral risk factors. Although age was not significantly associated with insufficient physical inactivity, older and younger age groups (60–64 years and 30–39 years) were more likely to be inactive as compared to the middle-aged population (40–59 years). The odds of physical inactivity were almost twice as high in urban residents as compared to rural (odds ratio [OR]: 1.97, 95% CI: 1.76–2.22). Education of more than 8th standard (OR: 1.36, 95% CI: 1.20–1.53) and unemployment (OR: 2.97, 95% CI: 2.59–3.39) was also significantly associated with insufficient PA [Table 2]. This study documents the prevalence of insufficient PA among rural and urban residents of Vellore, Tamil Nadu, India. The prevalence of insufficient PA in this study was 63.3% in urban and 40.6% in rural areas, which was only slightly lower than the ICMR-INDIAB study (71% urban, 55.4% rural) as well as the IDSP survey (71% urban, 62.0% rural) for Tamil Nadu., The prevalence of inactivity in Vellore was similar to the prevalence in Maharashtra (65.4% urban, 50.4% rural), lower than Chandigarh (73.2% urban, 64.4% rural), but higher than Jharkhand (47.8% urban, 28.9% rural). The higher prevalence of insufficient PA in urban areas in this study is seen both in India and globally, indicating that increasing urbanization will play an important factor which may lead to an increase in the prevalence of this cardiovascular risk factor. Overall percentage of the population with any leisure time activity was very low in this study (urban 6.7%, rural 1.9%) as in other Indian states,, although a larger proportion of urban residents reported such activity, with comparatively less involvement in work- and travel-related activity compared to their rural counterparts. This may indicate an increasing awareness of the need for PA among the urban residents. Although, in the IDSP study, work-related activity was the most common type of activity in Tamil Nadu, in this study, travel-related activity was more common than work-related activity, in both urban and rural areas. This may be related to the fact that strenuous activity at work may be reducing due to less involvement in such jobs, given the widespread increase in mechanization and urbanization. However, those who were unemployed were more likely to be inactive, suggesting that lack of work-related activity also contributes to overall inactivity. The higher prevalence of insufficient PA in women has also been seen in other studies,,, with the difference in this study being more pronounced in the urban area, as compared to the rural area. The prevalence of insufficient PA among urban women in this study was 70.8%, which was far higher than among women in an urban setting in Kerala (26.6%). Possible reasons for this difference could be differences in socioeconomic status, educational level, occupational involvement, and environmental factors. Marital status was associated with insufficient PA in this study, with those who were currently not married having a higher prevalence, which is similar to a recent review which showed that this group has a higher incidence of cardiovascular morbidity and mortality. In our study, both the youngest and oldest age groups were found to have higher levels of insufficient PA than those in the middle-aged groups. The IDSP survey also found a similar pattern of higher PA among the middle-aged group (35–44 years), as compared to those who were aged younger or older. Although reasons for this pattern were not explored in this study, it may possibly be related to issues such as poor mobility for older age groups and lack of time for the younger age groups. Increasing education was found to be associated with lower PA both in the IDSP study and in this study, as those with higher education were significantly more likely to be physically inactive. This is probably because those with higher education are less likely to be involved in strenuous work-related activity (manual labor) and are also likely to have less travel-related PA (walking or cycling to work), as higher education is associated with a higher socioeconomic status. This pattern of greater prevalence of cardiovascular risk factors in those with a higher socioeconomic status has been seen previously in studies from urban and rural India., However, a cross-sectional study in 11 cities in India, in middle-class settings, showed that low educational status was associated with insufficient PA. This implies that the association of socioeconomic class and cardiovascular risk factors in India is very variable, as the country is in a state of epidemiological transition, with differential stages of transition across the states. Limitations of this study included the inclusion of only one district in Tamil Nadu, the possibility that the nonresponders for this survey may have been more physically active and that women formed a little more than half of the participants (56%), compared to 49.9% of females in the entire state of Tamil Nadu. However, at least three attempts had been made to contact the participants at home. The prevalence of insufficient PA is high in both urban and rural areas in Tamil Nadu, with higher prevalence among the urban, unemployed, women, affluent, and middle-aged groups. More studies on insufficient PA are warranted in India with a special focus on women, especially in the urban areas, exploring barriers and identifying solutions to bring about the necessary change. Such studies can help guide policymakers in bringing in multisectoral interventions to develop policies for active promotion of healthy lifestyles. Given that the state of Tamil Nadu is making good progress in controlling other causes of mortality and mortality, it is time to increase efforts into health promotion and enable people to make and sustain healthy lifestyle-related choices. The study was funded by the Indian Council of Medical Research (Grant No. 50/3/TF/DV/06-NCD-II). We also thank Dr. K. R. Thankappan from the Achutha Menon Centre for Health Science Studies at Sree Chitra Tirunal Institute for Medical Sciences and Technology, Trivandrum, Kerala, for his valuable advice and the Excellence in NonCOmmunicable disease REsearch program funded by the International Research and Research Training Fund, University of Melbourne, Melbourne, Australia, for facilitating the research collaboration. The study was funded by the Indian Council of Medical Research. Kohl HW 3rd, Craig CL, Lambert EV, Inoue S, Alkandari JR, Leetongin G, et al. The pandemic of physical inactivity: Global action for public health. Lancet 2012;380:294-305. Sallis JF, Bull F, Guthold R, Heath GW, Inoue S, Kelly P, et al. Progress in physical activity over the Olympic quadrennium. Lancet 2016;388:1325-36. Lee IM, Shiroma EJ, Lobelo F, Puska P, Blair SN, Katzmarzyk PT, et al. Effect of physical inactivity on major non-communicable diseases worldwide: An analysis of burden of disease and life expectancy. Lancet 2012;380:219-29. Ding D, Lawson KD, Kolbe-Alexander TL, Finkelstein EA, Katzmarzyk PT, van Mechelen W, et al. The economic burden of physical inactivity: A global analysis of major non-communicable diseases. Lancet 2016;388:1311-24. Ekelund U, Steene-Johannessen J, Brown WJ, Fagerland MW, Owen N, Powell KE, et al. Does physical activity attenuate, or even eliminate, the detrimental association of sitting time with mortality? A harmonised meta-analysis of data from more than 1 million men and women. Lancet 2016;388:1302-10.
WHO. Global Health Observatory. Insufficient Physical Activity. Geneva, Switzerland: World Health Organization; 2015. Available from: http://www.apps.who.int/gho/data/node.main.A892?lang=en. [Last accessed on 2018 Jun 24]. Anjana RM, Pradeepa R, Das AK, Deepa M, Bhansali A, Joshi SR, et al. Physical activity and inactivity patterns in India-results from the ICMR-INDIAB study (Phase-1) [ICMR-INDIAB-5]. Int J Behav Nutr Phys Act 2014;11:26. National Institute of Medical Statistics, Indian Council of Medical Research (ICMR). IDSP Non-Communicable Disease Risk Factors Survey, Phase-I States of India, 2007-08. New Delhi, India: National Institute of Medical Statistics, Indian Council of Medical Research; 2009. Bauman AE, Reis RS, Sallis JF, Wells JC, Loos RJ, Martin BW, et al. Correlates of physical activity: Why are some people physically active and others not? Lancet 2012;380:258-71. India State-Level Disease Burden Initiative Collaborators. Nations within a nation: Variations in epidemiological transition across the states of India, 1990-2016 in the Global Burden of Disease Study. Lancet 2017;390:2437-60. Oommen AM, Abraham VJ, George K, Jose VJ. Rising trend of cardiovascular risk factors between 1991-1994 and 2010-2012: A repeat cross sectional survey in urban and rural vellore. Indian Heart J 2016;68:263-9. World Health Organization. STEPwise Approach to Surveillance (STEPS). Available from: http://www.who.int/chp/steps/en/. [Last accessed on 2018 Jun 24]. Oommen AM, Abraham VJ, George K, Jose VJ. Prevalence of risk factors for non-communicable diseases in rural & urban Tamil Nadu. Indian J Med Res 2016;144:460-71. Oommen AM, Abraham VJ, George K, Jose VJ. Prevalence of coronary heart disease in rural and urban Vellore: A repeat cross-sectional survey. Indian Heart J 2016;68:473-9. World Health Organization. Global Physical Activity Surveillance. Available from: http://www.who.int/ncds/surveillance/steps/GPAQ/en/. [Last accessed on 2018 Jun 24]. World Health Organization. Global Recommendations on Physical Activity for Health; 2010. Available from: http://www.who.int/dietphysicalactivity/publications/9789241599979/en/. [Last accessed on 2018 Jun 24]. World Health Organization. Global Status Report On Non Communicable Diseases; 2010. Avilable from: http://www.who.int/nmh/publications/ncd_report2010/en/[Last accessed on 2018 Jun 24]. Tripathy JP, Thakur JS, Jeet G, Chawla S, Jain S, Prasad R, et al. Urban rural differences in diet, physical activity and obesity in India: Are we witnessing the great indian equalisation? Results from a cross-sectional STEPS survey. BMC Public Health 2016;16:816. Mathews E, Pratt M, Jissa VT, Thankappan KR. Self-reported physical activity and its correlates among adult women in the expanded part of Thiruvananthapuram city, India. Indian J Public Health 2015;59:136-40. Wong CW, Kwok CS, Narain A, Gulati M, Mihalidou AS, Wu P, et al. Marital status and risk of cardiovascular diseases: A systematic review and meta-analysis. Heart 2018. pii: heartjnl-2018-313005. Singh RB, Beegom R, Mehta AS, Niaz MA, De AK, Mitra RK, et al. Social class, coronary risk factors and undernutrition, a double burden of diseases, in women during transition, in five Indian cities. Int J Cardiol 1999;69:139-47. Gupta R, Deedwania PC, Sharma K, Gupta A, Guptha S, Achari V, et al. Association of educational, occupational and socioeconomic status with cardiovascular risk factors in Asian Indians: A cross-sectional study. PLoS One 2012;7:e44098.